Not all sharks are lone hunters of the deep. 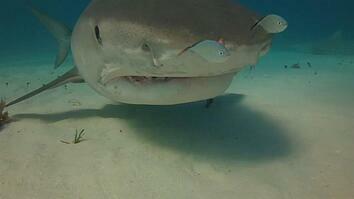 Check out the surprisingly social lemon shark. But he's never seen anything like this, dozens of them, huddled together on the bottom. Here off the coast of Jupiter, Florida, he's about to dive 80 feet below to find out why. As Gruber gets deeper, it's clear he's not alone. A school of more than 3 dozen adult lemon sharks, ready and waiting. Some are as long as 10 feet. An awesome sight - but it doesn't stop Gruber from getting close enough to touch them. What are so many sharks doing in the same place at the same time? He believes the predators are displaying what he calls "refuging behavior." Sam Gruber, Marine Biologist - "They're out and about when the sun goes down, they are out feeding, moving around and then when the sun comes up they begin to go to this particular place where they can assemble and rest on the bottom. Now resting on this bottom gives them a little bit of energetic edge in the sense that they can face up in to the current and they don't have to swim to breathe." But there may be more to it than "resting". 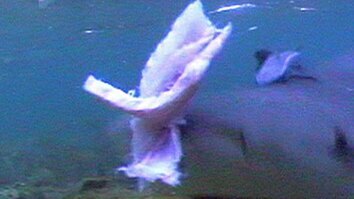 Lemon sharks are social animals and sometimes school in small groups of 4 or 5. This might also be a sort of mating game. Sam Gruber, Marine Biologist - "The females are assembling here in order to attract males, that's what I think is going on here. The way it works I think, is that early in December a group of females who know to come here because they've done it year after year, will assemble at this site." Gruber suspects female lemon sharks have chosen this reef as a place for producing chemical signals called "pheromones". The pheromones are carried by the currents, and they attract potential male suitors. And then it's on to the domestic phase. Sam Gruber, Marine Biologist - "When this group reaches a critical mass, say around February or March, they begin to move out and they move to the lagoon where mating and birthing will take place from April through June. 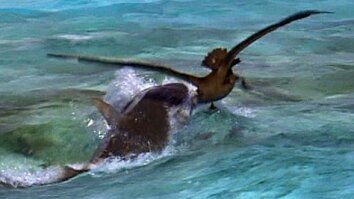 And if Gruber's hunch is right, he can expect another miracle soon, when these creatures bring a new generation of lemon sharks into the ocean.